Contact us now about your event! We are experts in corporate team building and that is our only business Monday through Friday (we are not open to the public during the week). We have plenty of room to host large teams, and each corporate reservation is a private experience for the games you reserve. 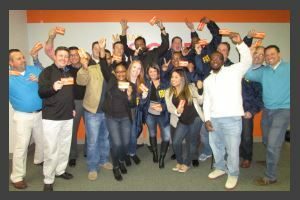 We were the first escape game in Georgia, have the most immersive technology and the only one 100% dedicated to corporate team building during the week. We design all our games in-house with team building in mind. 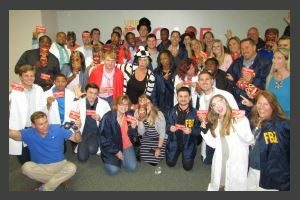 If your business, group or organization is looking for a unique and fun team building event, then look no further! Contact us now to discuss your event with one of our experts. Also, if you can’t come to us, we can host an escape game at your office or conference. In the Team Builder: Your team will enter one of our themed game rooms, where they will have one hour to figure out how to escape. They will need to find clues, solve puzzles, crack codes, and investigate everything to make it out in time! Teamwork and communication are critical! You’ll see your team work together like never before as they race against the clock to try to make their escape! Teamwork: Your group will have to work together and come up with ideas on how to crack codes and work through the different challenges they may encounter in the escape rooms. They will also learn about each other by interacting with one another and expressing themselves in a way they are less likely to at work. Your team will get to know each other better as they work together to escape. Communication: The true key to success in our games is effective communication. As the team encounters each new challenge they will have to organize their thoughts and decide how to proceed. Teams that communicate their ideas and work through them together have a higher chance of success than teams that try to tackle each challenge as individuals. Leadership: During a fast-paced hour of communication and teamwork, the natural leadership styles within your group will surface. You may see team members lead the way by asking guiding questions, working to keep the team’s thoughts organized, or being vocal about a solution the team is working on. Our Game Masters take notes as they watch your group closely, and the debrief is an awesome opportunity to discuss the roles that each person took on. 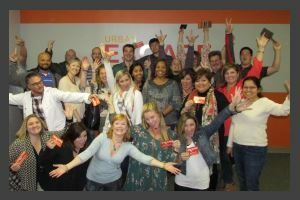 We look forward to seeing your corporate group at Urban Escape Games. Site © 2019 Urban Escape Games, LLC, all rights reserved. The Urban Escape Game “logo” and “lock” are Trademarks of Urban Escape Games, LLC.